Congratulations to champion Rupert Derham and doubles champions Richard Ramjane and David Lowry! 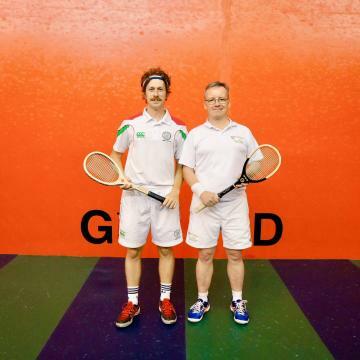 The fifteenth annual Irish Real Tennis Championship took place over the weekend of 9th–10th September, 2017. The entrants congregated at Prested Hall Tennis Club shortly before 9am on Saturday morning for a busy day of singles and doubles matches. 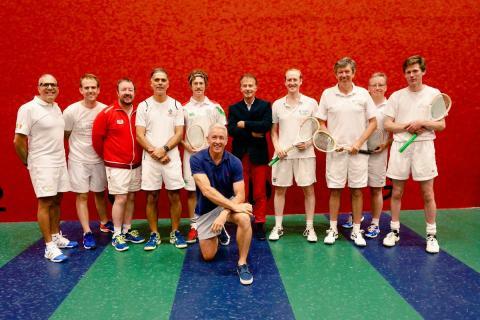 We were fortunate to have use of the two courts, which opened in 1999, and we were thrilled to be hosted by multi world champions Rob Fahey and Claire Fahey (née Vigrass), as well as Ged Parsons, the professionals at Prested. 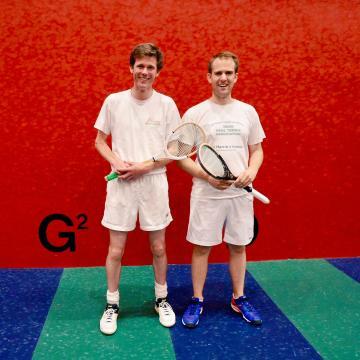 The two first round matches saw Vince Lucey and Tony Penny progress, both in tight matches, although they went on to lose to the number one and two seeds (Roland Budd and Rupert Derham) respectively in the next round. 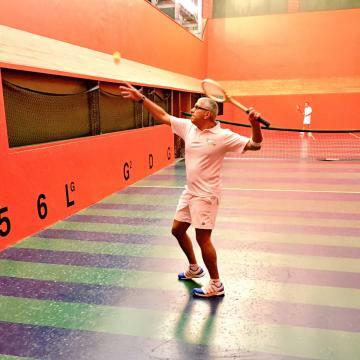 Rustom Manecksha produced a sterling come-back display of determination as he prevailed 6–5 in the third set against Mark Heffernan to get to the semi-finals in a match that went right to the wire. Richard Ramjane produced a steady, clinical performance on his home court to dispatch David Lowry and also reach the semi-finals. The semi-finals provided some fabulous tennis for spectators as the top four seeds took each other on. Manecksha won the first set against Budd with some sinister railroads and precision ground-strokes, only for Budd to hit back and hold his nerve for a 6–5 second set before running away 6–3 in the third to march on to the final. Derham continued the dominance of the seedings as he powered his way past Ramjane with a 6–3, 6–4 win. This left a final to be contested between the top two seeds, with the half-handicap difference meaning Budd would owe Derham half-15. The final was a delight for all to watch as each game was tightly fought. A clearly stimulated, energetic Derham ground out a 6–3 first set advantage before Budd produced some sterling tennis in the second set in a characteristically stoic, determined manner. This wasn’t enough to dampen the sweat-laden, ruddy Derham as he prevailed 6–4 to take the second set and the match, to the appreciative applause of the gallery. The plate competition was a hotly contested affair this year. All first-round losers were entered and Simon Cripps took on Vince Lucey in the first game. The half-handicap difference proved a step too far for Cripps as he was defeated 6–5, 6–2 despite playing some improving tennis through the morning. Tony Penny struggled valiantly with injury before being beaten by Jack Woods in two sets. 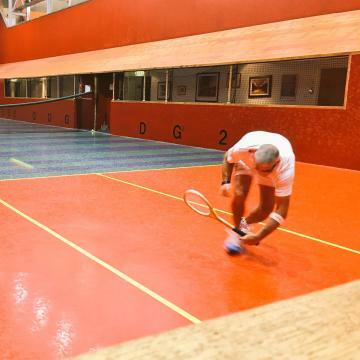 In the semis, Lucey stormed past Mark Heffernan with a 6–2, 6–2 victory, perhaps Heffernan having over-exerted himself with a spicy warm-up session the preceding evening. In the other semi-final there was a true epic as Jack Woods took on David Lowry. Woods stormed to a lead in the first set before being clawed back, although he sealed the key point at 40–40 and 5–5 to take the first set. Lowry cruised the second set 6–2 as he turned on the style to tie the match 1–1. He proceeded to a 5–3 advantage in the third before allowing Woods back in to 5–5 under intense pressure. The match was destined for a deciding point at 40–40 in the third set and so it proved, with Lowry getting his revenge, sealing the point and the match. He carried his momentum into the final against Lucey, who put up a valiant defensive effort but was out-played by some magnificent Lowry shot-making and energy as he won the plate 6–2, 6–2. The doubles tournament took place alongside the singles draw with the pairings assigned according to handicap: the strongest with the weakest, the second-strongest with the second-weakest, and so on. It was a tightly fought competition as three pairs won three matches each, thus separated only by overall games won in the reckoning. Heffernan/Penny never quite sparked together as they lost three of their encounters, their only victory being against the hapless Derham/Cripps, who won only two games in their set of matches. Manecksha/Lucey took Ramjane/Lowry to 5–5 before they prevailed in the deciding game. However, an earlier 6–2 loss to Budd/Woods meant that they were always going to be playing catch-up and was ultimately to cost them. The tournament came down to a deciding match between Budd/Woods and Ramjane/Lowry. The latter pairing started consistently and were ruthlessly accurate, producing a clinical display to march to a 6–2 win and take the prize with a total of 23 games won over their four matches. The IRTA took on Prested Hall Tennis Club in a match on Sunday 10th September, which turned out to be a competitive but convivial clash. Manecksha in both singles and doubles, and Budd in the doubles, produced strong performances to give the IRTA a lead early on. Cripps and Woods weren’t able to build on the momentum despite some well-matched opposition and the IRTA slipped behind. With Penny carrying an injury, and Lucey and Ramjane having jumped ship to play for their home club, the IRTA lost out in the overall standings. 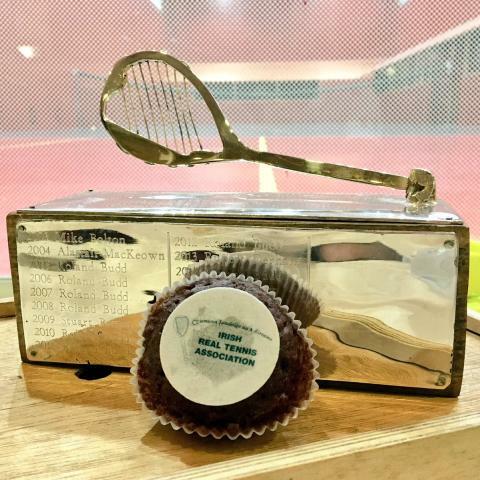 The IRTA was delighted to enjoy such a warm reception at the splendid facilities at Prested Hall, and very much appreciated the opportunity to play so much tennis in the course of the weekend. We also enjoyed some Padel Tennis on the new courts at Prested: a new experience for most IRTA players. A big thank you from the IRTA to Prested Hall and their professionals. Also, to Ben and Bear North and Roland Budd, who put in so much hard work to make these weekends happen and run smoothly. the person has had one year’s continuous residence in the island of Ireland immediately before the Championship and intends to continue residence in the island of Ireland.